Have you ever held a book in your hand and just knew right away that there was something special about it? 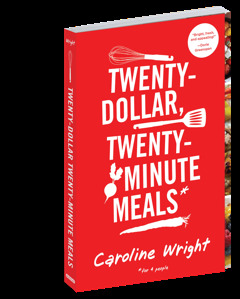 That's the case with Twenty-Dollar, Twenty-Minute Meals by newly minted cookbook author Caroline Wright. Having had the pleasure of working with Caroline at Everyday Food, I knew that she was bound for bigger things and it was no surprise to find out she was working on this cookbook. I first heard about it some years ago and had the pleasure of testing some of its recipes when the book was just a manuscript. And I have since added many of those recipes to my repertoire, including my favorite, the Catfish Sandwiches with Radish Remoulade on page 52. So when I heard the book was being published by Workman, I was overjoyed with the prospect that Caroline's 20/20 concept would be available for all to use, not only her friends. This cookbook is brimming with playful photography of food that you just want to stuff your face with. Caroline's recipes are simple, effortless roadmaps for getting dinner on the table for four people in 20 minutes or less, with each recipe coming in under $20. Now for busy folks like me who are on a tight budget, it's a godsend for sure. And not to mention these recipes are great for leftovers the next day. If you happen to be a single person or one half of a couple, those two to three extra portions are just as good enjoyed the next day. These recipes are not just for dinner or four people for that matter. To celebrate the launch of the book, Caroline is hosting a virtual dinner party. 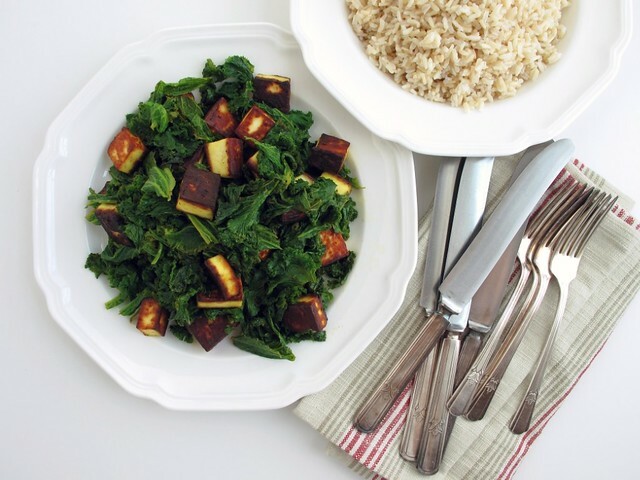 And for this special event I made the Mustard Greens and Paneer with Indian Spices on page 155, a very easy dish that makes a great vegetarian dinner when served with flatbreads and/or rice. The Indian cheese paneer has a great texture like firm tofu when it's fried. The mustard greens take on an even spicier flavor when cooked with Indian spices. You'll definitely like a bowl of rice or bread to tame your palate if you're not used to the heat, but I adore some good spicy food to get my blood circulation going. If you're looking for the next great cookbook, one that you'll wan to use every day, then look no further. I'm giving away a copy of Caroline's new book, Twenty-Dollar, Twenty-Minute Meals. Leave a comment below and one winner will be chosen randomly. The winner will be announced on May 14 at 9pm. Comment only once. Duplicate entires will not be considered. Heat 2 tablespoons vegetable oil in a large skillet over medium-high heat. Add 8 ounces paneer cheese, cut into 1-inch cubes, and fry until golden, 6 to 8 minutes; transfer to a plate. Place 1/2 teaspoon garam masala, 1/2 teaspoon ground turmeric, and 1/4 teaspoon ground cayenne pepper in the skillet, and toast until fragrant, about 30 seconds. Add coarsely chopped leaves from 1 bunch mustard greens (about 1 pound) and cook, tossing occasionally, until wilted and tender, 5 to 7 minutes. Stir in the paneer and serve. You can find a version of lentil stew or soup in almost every country. It's a dish that's popular because it's hearty, filling, and inexpensive. Some would call it food for the poor, but lentils stand for more than just that. Many cultures give it significant meaning, equating the small legumes with coins, symbolizing prosperity. Besides that, lentils are very nutritious, delicious, and perfectly satisfying on a cold fall day. 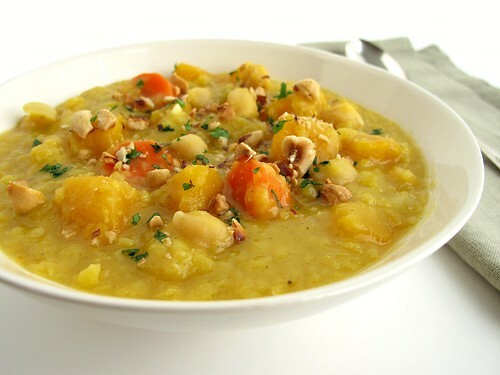 The cuisine of Morocco inspires this dish, which features a classic combination of lentils, chickpeas, and squash. Ras el hanout, the Moroccan spice blend, as well as saffron, give this stew its exotic flavor. Translating to "top of the shop," Ras el hanout is a special spice blend that is traditionally sold in markets by spice mongers, each of whom has his own secret mix, which can include cumin, cardamom, cloves, cinnamon, cardamom, pepper, and other spices. It's like the Moroccan version of the Indian spice blend Garam Masala. The choice is yours—make this recipe into a stew or soup. The ingredients give you the option of using more or less stock, depending on how thick or thin you want the consistency. Since this recipe uses vegetable stock and contains no dairy, it's completely vegan. But all you omnivores, don't be afraid, it's packed with protein and fiber, so you won't even miss the meat. But if you can't live without meaty flavor, use chicken stock. Note: If you can't find Ras el hanout, substitute Garam Masala. Warm oil in large pot or Dutch oven set over medium-high heat. Add onion, garlic, and ginger. Sauté until onion is soft, about 3 to 5 minutes. Add Ras el hanout, cumin, and coriander and toast until fragrant, about 1 to 2 minutes. Pour in stock. Add squash, carrots, lentils, and chickpeas. Add saffron and season with salt and pepper. Bring to a boil and reduce to a gentle simmer. Cook, partially covered, until chickpeas are tender, about 30 minutes. Serve in bowls and garnish with chopped hazelnuts and chopped parsley. Yield: 6 to 8 servings. Baking season is in full swing and it seems that everywhere you turn there are cookies. Everyone loves biting into a sugary Christmas cookie. But I think the best part about cookies is making them yourself, and getting kids and even the adults involved. Baking batches of all different types of cookies is my specialty at Christmas. I bring them to parties at the office and share them with neighbors and friends. I always have some on hand for when people stop by to visit, which can happen quite often during the holidays. There are so many ways to get involved in the holiday baking fun. Hosting a cookie-baking party is a great way to bring people together. Everyone can decorate their own cookies to eat and take home. Cookie swap parties also have recently become very popular. They offer the opportunity to show off your personal creations and share them with friends. The best part is guests get to go home with a variety of cookies all ready for them to share with their families. Buttery shortbread cookies are my favorite to eat and make. They are easy to cut out and they don't lose their shape when baked. This recipe is basically shortbread dough but with coconut flakes for added festive flair. Coconut easily takes any sweet treat to the next level. Here shredded coconut is ground fine until it resembles snowflakes. Mixed into the dough, it creates a speckled cookie. Cut them out with snowflake cookie cutters, and they truly take on the look of snowflakes. Decorating with a bit of raw sugar adds to the wintry look. Share these with family, friends, and neighbors. Add coconut to the bowl of a food processor. Pulse until flakes are finely ground. In a medium bowl, whisk together dry ingredients: coconut flakes, flour, baking powder, and salt. In a stand mixer fitted with the paddle attachment, beat the butter and sugar on medium speed until light and fluffy. Add egg and vanilla extract; mix until combined. Add the dry ingredients a little at a time on low speed, scraping down the sides of the bowl. Mix until combined. Form dough into two disks and wrap in plastic. Chill for 30 minutes to 1 hour. Preheat oven to 350 degrees F. Line three baking sheets with parchment paper or Silpats. Roll out one disk of dough between two pieces of plastic wrap to 1/4 inch thick. Keep second disk in refrigerator until ready to roll. Chill rolled dough for 20 minutes. Cut out cookies using a 3-inch snowflake cookie cutter or a 4-inch snowflake cookie cutter with a 1-1/2-inch snowflake cookie cutter for the center. Carefully transfer cookies using a metal spatula to lined baking sheets, arranging an inch apart. Reshape scraps of dough into a disk, wrap in plastic, and keep in refrigerator until ready to roll again. 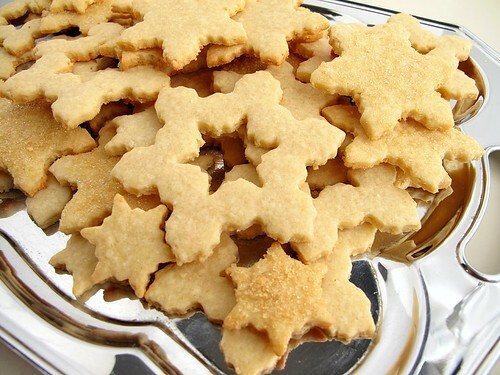 To decorate cookies with sugar, brush with a bit of water and sprinkle with turbinado sugar or sanding sugar. Bake cookies until golden, about 10 to 15 minutes. Let cool slightly in pan and transfer to a wire rack to cool completely. Yield: about 60 cookies in various sizes. Thanksgiving would not be complete without pie for dessert. And I think that everyone would agree that the classic pies of pecan, pumpkin, sweet potato, or apple are just as important as the main meal itself. Even when we are stuffed to the brim with turkey and all the sides, there is always room for dessert. Pumpkin pie is my favorite, but right behind it is pecan pie. I love all nuts, but pecans are on top of my list with their sweet, nutty, and buttery flavor. Pecans are especially loved in Southern cuisine, both sweet and savory recipes. Pecans have Southern roots, literally because they are native to the South. Pecan trees are plentiful throughout the Southern states, from Iowa to Texas, with Georgia being the biggest commercial producer. Native Americans introduced pecans to the French settlers in New Orleans and since then the nut and the pie have been considered Southern specialties. It is more than likely that the French came up with the pie recipe, but Karo, the makers of corn syrup, claim that they invented the pecan pie in 1930 to popularize the syrup. Still, the pie is a classic no matter who claimed to have invented it. Instead of corn syrup, my recipe uses Lyle's golden syrup, which is inverted sugar syrup made during the process of refining cane juice into sugar. It has the color of honey and a slight molasses flavor. Golden syrup was invented by a Scotsman in 1883 and is very popular in Britain. It's also commonly used in Cajun cuisine in Louisiana. 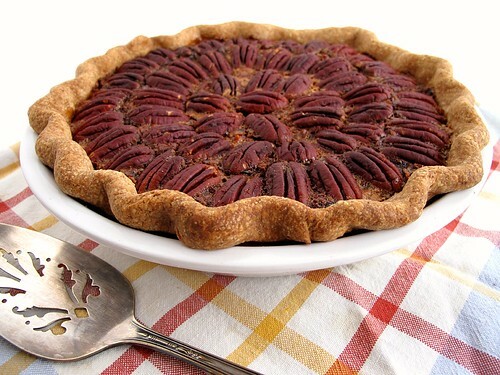 I'd like to think that the original French recipe for pecan pie might have used it. For a New England twist, I add maple syrup, which lends even more depth of flavor. To create an extra crispy crust, I use whole-wheat flour. But the most important ingredient is pecans, and lots of them. This pie has a lot of sweet going on, but that is perfectly authentic for the holiday. Note: Find Lyle's Golden Syrup in the international aisle of the supermarket, specialty British shops, or online. On a lightly floured work surface, roll out pie dough to 1/4-inch thickness. Carefully lay dough into a 9-inch pie pan. Press dough into the sides. Remove excess dough with a knife. Crimp the edge using your thumb and forefingers. Chill for 15 to 20 minutes. In a large bowl, using a whisk, beat together eggs and sugar. Add golden syrup, maple syrup, and vanilla extract; beat to combine. Stir in chopped pecans. Pour filling into pie shell. Arrange pecan halves decoratively on top of filling. Bake for 15 minutes at 400 degrees F. to crisp the crust. Lower heat to 350 degrees F. and bake until filling is set and puffed, about 1 hour, 15 minutes. A skewer inserted into the center should come out clean. Let cool completely. Serve at room temperature or chilled. Yield: 8 to 10 slices. Note: This recipe uses white whole-wheat, which is made from the bran and germ of white wheat rather than red wheat. It's nutrient content is practically the same as regular whole wheat (made from red wheat), but the flavor is less bitter. It also has a lower gluten and protein content. If you can't find it, substitute whole-wheat or all-purpose flour. Combine flour, sugar, and salt in a large bowl. Mix together with a whisk to aerate. Add butter and work with a pastry blender until mixture resembles course meal. While mixing, drizzle water into dry ingredients 1 tablespoon at a time. Mix until dough comes together. If too dry, 1 to 2 tablespoons ice water can be added. Form the dough into a flat disc and wrap in plastic. Chill for at least 1 hour before rolling. I have a special fondness for pot pie. It's one of those all-in-one meals that always hits my comfort spot. And it's a welcome dish to eat on a cold and rainy day like the ones we're having this season. 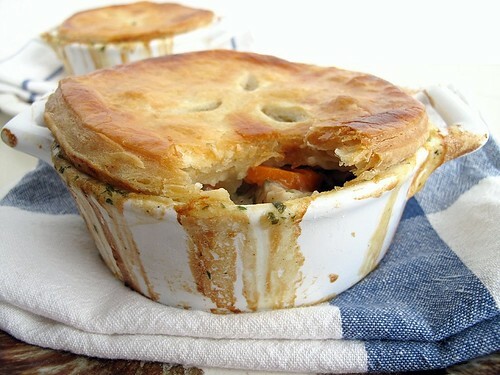 The origins of pot pies can be traced back to the English settlers who brought their love for pies to America. In the States I had never eaten a savory pie. It was always the frozen pies that scared me into believing that pies were no good. Not until my traveling in England did I finally eat my first savory pie. On first bite I fell in love with the flavorful meat and vegetable filling topped with flaky, buttery pastry. While studying abroad in London, I came to know and appreciate the local cuisine. It was the discovery of a small eatery that really caught my attention and helped change my mind about pies. Every day on my way to class through an alley passage I couldn't help but notice a sign that read "Upstairs Pie Room" right next to an unassuming door. One day a group of us decided to find out what this room was all about. We discovered a homey little restaurant with a menu of traditional English savory pies. It was was one of the best things that could happen. That summer the Pie Room ended up becoming a regular haunt for all of us. The experience turned out to be one of my most memorable, one that I repeated many times until I had tried every pie on the menu. Inspired by all those pies, I created a pot pie recipe that is as classic and original to the one I remember eating in London. First, chicken breasts are roasted until tender. A thick sauce is made with butter, onions, flour, and stock to which hearty vegetables and the cubed chicken is added. The pie can be cooked in one large casserole dish, but since the Pie Room specialized in personal pies, I divided the mixture among oven-proof dishes. Each is topped with a round of puff pastry and baked until brown and bubbly. The end result is hard to resist and one bite may even convince you to visit the Pie Room and try all the pies for yourself. Rinse chicken breasts and pat dry. Add to baking sheet. Drizzle with oil and rub all over. Season with salt, pepper, and poultry seasoning. Roast until juices run clear, about 30 to 40 minutes. An instant-read thermometer when inserted into the thickest part of the meat should read 165 degrees F. Let chicken cool until easy to handle. Discard skin and remove bones. Cut into large cubes. Heat chicken stock until very hot. Pour a bit of stock into roasting pan to loosen brown bits; add it back into stock. Melt butter in a large pot over medium-low heat. Add chopped onion and sauté until soft and translucent, about 10 minutes. Add flour and cook, constantly stirring, for 2 minutes. Pour in hot stock and stir to combine. Simmer on low, while stirring, until liquid thickens, about 5 minutes. Season with salt and pepper. Add cream, cubed chicken, pearl onions, carrots, peas, and parsley. Mix well to combine. Divide the mixture among 4 oven-proof bowls. On a well-floured work surface, roll out puff pastry to 1/4-inch thick. Cut 4 discs to fit each bowl. Slash a few vent holes in each disc. Brush the edge of each bowl with egg wash. Place dough on top. Brush dough with egg wash. Place bowls on a baking sheet lined with aluminum foil. Bake until pastry is golden and filling is bubbling, about 40 minutes. Yield: 4 servings. Adapted from a recipe by Michel Richard in Baking with Julia by Dorie Greenspan. Combine flours and salt in a food processor. Pulse to aerate. Add the water and pulse until a ball forms. Remove and form into a disc. Slash the top in a tic-tac-toe pattern. Wrap in a damp towel and refrigerate for about 5 minutes. Meanwhile, place the butter between two sheets of plastic wrap and beat with a rolling pin until about 1-inch thick. Refrigerate until ready to use. Unwrap the dough and place on a well-floured work surface, preferably marble or granite. Flatten and roll the dough into a large square. Roll the edges thin while keeping the center thicker. Place the butter in the middle of the dough and fold over the corners overlapping like an envelope. Press the rolling pin against the edges, making sure the package is square. Make sure the work surface, dough, and rolling pin are well-floured. Roll the package of dough into a rectangle, three times as long as it is wide. Brush off any excess flour. Fold the dough in thirds, up from the bottom and down from the top, like a business letter. Rotate the dough counter-clockwise so that the closed fold is to the left. Roll the dough into a rectangle again, and fold into thirds again. The second turn is now complete. Wrap the dough in plastic and refrigerate for 30 minutes to 1 hour. Repeat again twice, wrap, and refrigerate. Then repeat again twice to equal six folds. Wrap the dough in plastic and refrigerate until ready to use. Leftover dough can be wrapped in plastic and frozen. Defrost before using. Yield: 2-1/2 pounds pastry. For a long time, the closest I had ever come to what I thought was a real fig was the dried kind or Fig Newtons. It wasn't until a family friend gave us a fig tree that I learned figs are actually fresh before they are dried. Not only that, but I discovered that fresh figs were worlds apart from the dried ones. We weren't the only family with a fig tree in the neighborhood. Italian and Portuguese neighbors had them too. That's because figs are native to the Mediterranean region, where they have been revered since ancient and biblical times. You can't not find mention of it in ancient Greek and Roman texts and of course the Bible's creation story. What would we have done without fig leaves? For a number of years we were lucky to have our own Garden of Eden with a flourishing fig tree in the backyard. With much ingenuity we were able to keep it protected through many winters until one year it finally didn't survive the cold. But I can never forget how anxious I was all summer long as I waited for the figs to ripen. It seemed to me they always took so long. But fig season is late September, so I had to learn to be patient because there was nothing I could do to speed up mother nature. Figs really are the fruit of the gods. They're unusual yet very succulent, tender, and sweet as honey when perfectly ripe. The interesting thing about them is that they are actually flowers not fruit. The little hole that exists on the underside is actually the opening that wasps enter to pollinate. Because these flowers or figs are so perishable, most are sold dried. Fresh figs can be very expensive, but when in season they can be found more affordably at farmers' markets. Now without a tree I buy my fresh figs at the market just like everyone else. 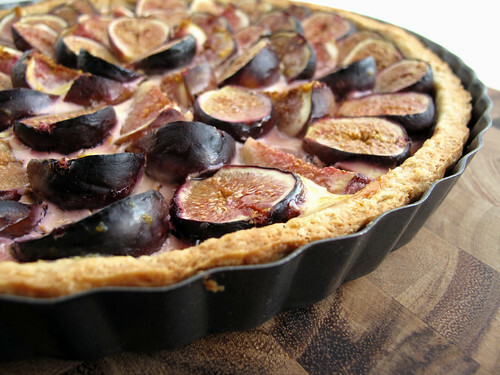 And this year I found the loveliest black Mission figs to create this Greek-inspired tart. When shopping for figs, look for ones that are plump but not mushy. Blemishes are not much of a concern unless the fruit looks damaged. Once home, the figs will ripen very quickly on the counter. But to slow the ripening process, stow them safely in the refrigerator until ready to eat or use. When they are ripe, figs should be soft to the touch, smell sweet, and a bit of sap-like liquid can ooze from the bottom. These are the kinds that are sure to taste like honey. For this recipe, ripe figs are the best. Filling inspired by recipe from Fine Cooking. Cut off stems from figs. Slice into halves if small or quarters if large. In a small bowl, combine yogurt, egg yolk, sugar, honey, and orange zest. Spread mixture in bottom of cooled tart shell. Arrange figs on top. Bake at 400 degrees F. for 30 minutes or until crust is golden brown, custard is set, and figs have released their juices. Serve warm. Yield: 10 to 12 slices. In a large bowl, combine flours, sugar, and salt. Mix together with a whisk to aerate. Add butter and work with a pastry blender until mixture resembles course meal. In a small bowl, beat together egg yolk and 3 tablespoons ice water. Drizzle liquid mixture into dry ingredients. Mix until dough comes together. If too dry, 1 tablespoon ice water can be added. On a lightly floured work surface, roll out tart dough to 1/8-inch thickness. Carefully lay dough into a 10-inch fluted tart pan with a removable bottom. Press dough into the sides. Remove excess dough with a knife. Fill any holes or gaps with excess dough. Chill shell for 15 minutes. Using a fork, prick the bottom of the pan all over. Line the inside of the pan with foil and fill with pie weights. Bake for 10 minutes. Then carefully remove pie weights with foil. Continue to bake until light brown, about 15 minutes. Let cool completely.